T, double-E-N, T-I, T-A, N-S! We the real heroes taking down the big menace! When there's real trouble, baby, Teen Titans Go! Surely you remember how cool the Hot Wheels Character Cars are. Well, I'd been eyeing the Teen Titans set, and after seeing Teen Titans Go! to the Movies, I took the plunge. "Show 'em your baby hands!" Nah, Robin Robin's are large! No they're not! Whatever! Just keep going! Just keep going! Toy #1 in the series is the Titans' leader, Robin. There have already been two Robins in the DC Character Cars lineup: a Tim Drake version that debuted in 2013, and then a Damian Wayne "2.0T" that came out last year. But this does not share its mold with either of them - to match Teen Titans Go! 's cartoony, superdeformed style, the vehicles are similarly exaggerated. 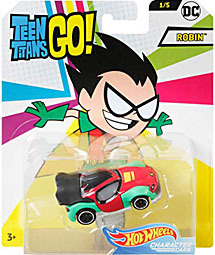 So TTG Robin ends up a sporty little coupe. However, that's not to say none of the design elements are shared. 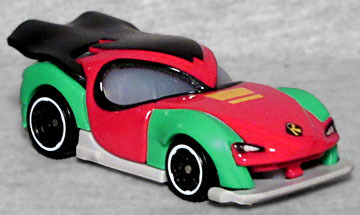 Like Damian, this Robin has a scoop air intake in the front, green fenders over all four wheels, and a windshield that's divided into two "eyes" with paint around it suggesting a mask. You may say it's a coincidence, that there are only so many ways to turn Robin into a car, but Tim didn't have any of those features. The lower edge and underside of the car are a light gray, like the soles of Robin's boots, his R symbol is placed like a hood emblem, and there's a bunch of black on the roof - both for Robin's hair, and for his cape. The coolest little feature is the license plate, which reads "TITANS GO." This entry was posted in blog exclusive review, Mattel, videos and tagged Batman, Hot Wheels, Teen Titans. Bookmark the permalink.